Love this recipe as is, have made it often, but as a variation I add a little minced fresh garlic and onions to the butter, sugar, salt, pepper & basil. These were wonderful and looked absolutely beautiful! 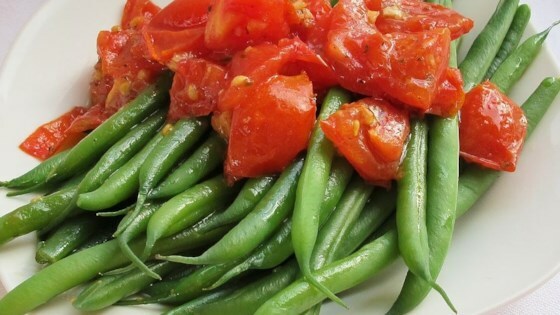 I used frozen whole green beans (16 oz), 1 cup of halved grape tomatoes, increased the fresh basil to 1T, and added more salt. Delicious! Yum! I thought these were excellent...a great way to get your vegetables in. I did what another user suggested and crumbled bacon on top and it was great! Will make again! Good recipe. I halved the butter and it was plenty. Next time I will use less sugar as it was a bit too sweet for my taste.